Y. Bengana, J.-Ch. Loiseau, J.-Ch. Robinet, L.S. Tuckerman, Bifurcation analysis and frequency prediction in shear-driven cavity flow (pdf), submitted. A. Ebo Adou, L.S. Tuckerman, S. Shin, J. Chergui, D. Juric, Faraday instability on a sphere: numerical simulations (pdf), to appear. Y. Bengana, L.S. Tuckerman, Spirals and ribbons in counter-rotating Taylor-Couette flow: frequencies from mean flows and heteroclinic orbits (pdf), Phys. Rev. Fluids 4, 044402 (2019). T. Dessup, L.S. Tuckerman, J.E. Wesfreid, D. Barkley, A.P. Willis, The self-sustaining process in Taylor-Couette flow (pdf), Phys. Rev. Fluids 3, 123902 (2018). L.S. Tuckerman, J. Langham, A.P. Willis, Order-of-magnitude speedup for steady states and traveling waves via Stokes preconditioning in Channeflow and Openpipeflow (pdf), in Computational Modelling of Bifurcations and Instabilities in Fluid Dynamics, Computational Methods in Applied Sciences, ed. A. Gelfgat (Springer, 2018). M. Brynjell-Rahkola, L.S. Tuckerman, P. Schlatter, D.S. Henningson, Computing optimal forcing using Laplace preconditioning (pdf), Commun. Comput. Phys. 22, 1508-1532 (2017). F. Feudel, L.S. Tuckerman, M. Zaks, R. Hollerbach, Hysteresis of dynamos in rotating spherical shell convection (pdf), Phys. Rev. Fluids 2, 053902 (2017). L. Klotz, G. Lemoult, I. Frontczak, L.S. Tuckerman, J.E. Wesfreid, Couette-Poiseuille flow experiment with zero mean advection velocity: subcritical transition to turbulence (pdf), Phys. Rev. Fluids 2, 043904 (2017). A. Ebo Adou, L.S. Tuckerman, Faraday instability on a sphere: Floquet analysis (pdf), J. Fluid Mech. 805, 591-610 (2016). F. Feudel, L.S. Tuckerman, M. Gellert, N. Seehafer, Bifurcations of rotating waves in rotating spherical shell convection (pdf), Phys. Rev. E 92, 053015 (2015). L.S. Tuckerman, Taylor vortices versus Taylor columns (pdf), J. Fluid Mech. 750, 1-4 (2014). H.A. Dijkstra, F.W. Wubs, A.K. Cliffe, E. Doedel, I.F. Dragomirescu, B. Eckhardt, A.Y. Gelfgat, A.L. Hazel, V. Lucarini, A.G. Salinger, E.T. Phipps, J. Sanchez-Umbria, H. Schuttelaars, L.S. Tuckerman, U. Thiele, Numerical Bifurcation Methods and their Application to Fluid Dynamics: Analysis beyond Simulation (pdf), Commun. Comput. Phys. 15, 1-45 (2014). Z. Gao, A. Sergent, B. Podvin, S. Xin, P. Le Quéré, L.S. Tuckerman, Transition to chaos of natural convection between two infinite differentially heated vertical plates (pdf), Phys. Rev. E 88, 023010 (2013). S. Shin, J. Chergui, D. Juric, A. Farhaoui, L. Kahouadji, L.S. Tuckerman, N. Périnet, Parallel direct numerical simulation of three-dimensional two-phase flows (pdf), 8th Int. Conf. on Multiphase Flow, Jeju, Korea, May 26-31, 2013. F. Feudel, N. Seehafer, L.S. Tuckerman, M. Gellert, Multistability in rotating spherical shell convection (pdf), Phys. Rev. E 87, 023021 (2013). L.S. Tuckerman, Motifs turbulent-laminaire dans l’écoulement de Poiseuille plan (pdf), in Rencontre du Non-linéaire 2009, ed. E. Falcon, M. Lefranc, F. Pétrélis, C.-T. Pham (Institut Henri Poincaré, Non-Linéaire Publications, 2013). P. Szaltys, M. Chrust, A. Przadka, S. Goujon-Durand, L.S. Tuckerman, J.E. Wesfreid, Nonlinear evolution of instabilities behind spheres and disks (pdf), J. Fluids Structures, 28, 483 (2012). L.S. 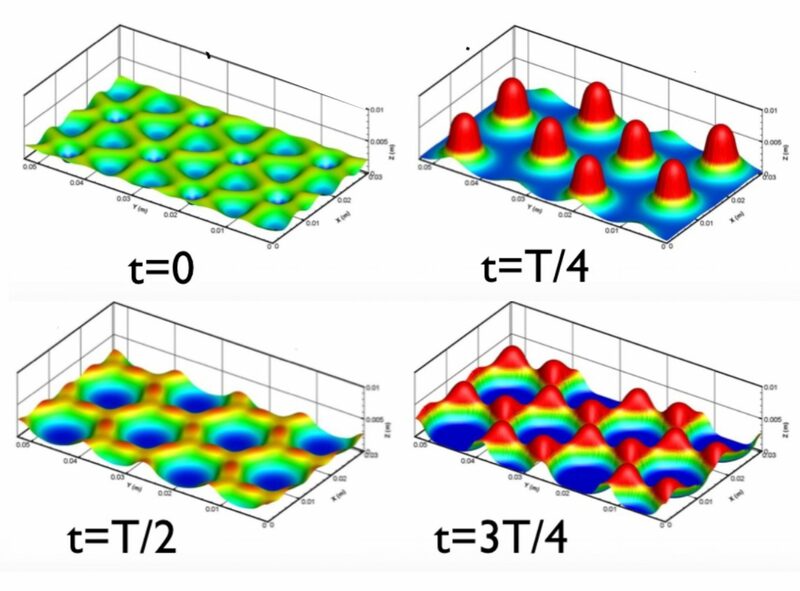 Tuckerman, D. Barkley, Patterns and dynamics in transitional plane Couette flow (pdf), Phys. Fluids 23, 041301 (2011). F. Feudel, K. Bergemann, L.S. Tuckerman, C. Egbers, B. Futterer, M. Gellert, R. Hollerbach, Convection patterns in a spherical fluid shell (pdf), Phys. Rev. E. 83, 046304 (2011). L.S. Tuckerman, D. Barkley, O. Dauchot, Instability of uniform turbulent plane Couette flow: spectra, probability distribution functions and K-Ω closure model (pdf). Seventh IUTAM Symposium on Laminar-Turbulent Transition, IUTAM Bookseries, Vol 18, Ed. P. Schlatter, D. Henningson (Springer, 2010). N. Périnet, D. Juric & L.S. Tuckerman, Numerical simulation of Faraday waves (pdf), J. Fluid Mech. 635, 1-26 (2009). Arxiv http://www.arxiv.org/abs/0901.0464 . (color preprint). N. Périnet, D. Juric, L.S. Tuckerman, Simulation numérique des ondes de Faraday (pdf) in Rencontre du Non-linéaire 2009, ed. M. Lefranc, C. Letellier, L. Pastur (Institut Henri Poincaré, Non-Linéaire Publications, 2009). L.S. Tuckerman, D. Barkley, D. Moxey, O. Dauchot, Order parameter in laminar-turbulent patterns (pdf), in Advances in Turbulence XII, Springer Proceedings in Physics, Vol. 132, p. 89-91, ed. B. Eckhardt (Springer, 2009) DOI: 10.1007/978-3-642-03085-7. L.S. Tuckerman, D. Barkley and O. Dauchot, Statistical analysis of the transition to turbulent-laminar banded patterns in plane Couette flow (pdf), J. Phys. : Conf. Ser. 137, 012029 (2008). K. Bergemann, F. Feudel, L.S. Tuckerman, GeoFlow: On symmetry-breaking bifurcations of heated spherical shell convection (pdf), J. Phys. : Conf. Ser. 137, 012027 (2008). L.S. Tuckerman, K. Boronska, Multiplicité extrême de motifs convectifs (pdf), in Rencontre du Non-linéaire 2008, ed. M. Lefranc, C. Letellier, L. Pastur (Institut Henri Poincaré, Non-Linéaire Publications, 2008). L.S. Tuckerman, Binary fluid convection as a 2 x 2 matrix problem (pdf), in Instabilities and non-equilibrium structures IX, ed. by O. Descalzi, J. Martinez, and S. Rica, (Kluwer, Dordecht, 2004). L.S. Tuckerman, C. Huepe, and M.-E. Brachet, Numerical methods for bifurcation problems (pdf), in Instabilities and non-equilibrium structures IX, ed. by O. Descalzi, J. Martinez, and S. Rica, (Kluwer, Dordecht, 2004). C. Nore, M. Tartar, O. Daube, and L.S. Tuckerman, Survey of instability thresholds of flow between exactly counter-rotating disks (pdf), J. Fluid Mech. 511, 45-65 (2004). Cambridge Online Journals page. C. Nore, L.S. Tuckerman, O. Daube, and S. Xin, The 1:2 mode interaction in exactly counter-rotating von Kármán swirling flow (pdf), J. Fluid Mech. 477, 51-88 (2003). Cambridge Online Journals page. K. Boronska and L.S. Tuckerman, Ondes stationnaires et progressives dans la convection de Rayleigh Bénard en géométrie cylindrique (pdf), in Rencontre du Non-linéaire 2003, ed. by R. Ribotta (Paris Onze Editions, Orsay, 2003). H. Hristova, S. Roch, P.J. Schmid, and L.S. Tuckerman, Transient growth in exactly counter-rotating Couette-Taylor flow (pdf), Theoretical and Computational Fluid Dynamics 16, 43-48 (2002). L.S. Tuckerman, La convection binaire comme problème matriciel 2 x 2 (pdf), in Rencontre du Non-linéaire 2000, ed. by R. Ribotta (Paris Onze Editions, Orsay, 2000). L.S. Tuckerman and D. Barkley, Bifurcation analysis for timesteppers (pdf), in Numerical Methods for Bifurcation Problems and Large-Scale Dynamical Systems, ed. by E. Doedel and L.S. Tuckerman (Springer, New York, 2000). L.S. Tuckerman, F. Bertagnolio, O. Daube, P. Le Quéré, and D. Barkley, Stokes preconditioning for the inverse Arnoldi method (pdf) in Continuation Methods for Fluid Dynamics (Notes on Numerical Fluid Mechanics, Vol. 74), ed. by D. Henry and A. Bergeon (Vieweg, 2000), p. 241-255. D. Barkley and L.S. Tuckerman, Diagramme de bifurcation pour écoulement de Couette plan perturbé (pdf) in Rencontre du Non-linéaire 2000, ed. by R. Ribotta (Paris Onze Editions, Orsay, 2000). D. Barkley and L.S. Tuckerman, Linear and nonlinear stability analysis of perturbed plane Couette flow (pdf), in Proceedings of the Seventh European Turbulence Conference, ed. by U. Frisch (Kluwer Academic Publishers, Dordrecht, 1998). S. Xin, P. Le Quéré, and L.S. Tuckerman, Bifurcation analysis of double-diffusive convection with opposing horizontal thermal and solutal gradients (pdf), Phys. Fluids. 10, 850-858 (1998). Xin et al., Phys. Fluids 10, 850 (1998). A. Bergeon, D. Henry, H. BenHadid, and L.S. Tuckerman, Marangoni convection in binary mixtures with Soret effect (pdf), J. Fluid Mech. 375, 143-177 (1998). Cambridge Online Journals page. D. Barkley and L.S. Tuckerman, Stokes preconditioning for the inverse power method (pdf), in Lecture Notes in Physics: Proc. of the Fifteenth Intl. Conf. on Numerical Methods in Fluid Dynamics, ed. by P. Kutler, J. Flores, and J.-J. Chattot (Springer, New York, 1997), p. 75-76. http://dx.doiorg/10.1007/BFb0107081 at Springer. T. Dauxois, S. Fauve and L.S. Tuckerman, Stability of periodic arrays of vortices (pdf), Phys. Fluids 8, 487-495 (1996). E. Chenier, C. Dang Vu, and L.S. Tuckerman, Computation of bifurcations in thermal and capillary convection, in Flow Modeling and Turbulence Measurements VI, ed. by C. Chen, C. Shih, J. Lienau, and R. Kung (Balkema, Rotterdam, 1996). C.K. Mamun and L.S. Tuckerman, Asymmetry and Hopf bifurcation in spherical Couette flow (pdf), Phys. Fluids 7, 80-91 (1995). Journal URL Mamun and Tuckerman, Phys. Fluids 7, 80 (1995). K. Kumar and L.S. Tuckerman, Parametric instability of the interface between two fluids (pdf), J. Fluid Mech. 279, 49-68 (1994). Cambridge Online Journals page . A. Bergeon, D. Henry, H. BenHadid, and L.S. Tuckerman, Stability analysis of Marangoni convection in binary mixtures subjected to the Soret effect, ASME J. of Heat Transfer, Heat Transfer in Microgravity Systems, ASME, HTD – Vol. 290, 63-69 (1994). W.S. Edwards, R.P. Tagg, B.C. Dornblaser, L.S. Tuckerman, and H.L. Swinney, Periodic Traveling Waves with Nonperiodic Pressure (pdf). Eur. J. Mech. B/Fluids 10, 205-210 (1991). Here is a compressed version (smaller file, lower quality) . These versions have been corrected to incorporate the Erratum in Eur. J. Mech./B 10, 575 (1991). Scans of the originals available upon request. L.S. Tuckerman and D. Barkley, Bifurcation analysis of the Eckhaus instability (pdf) , Physica D 46, 57-86 (1990). Summary, Abstract. doi:10.1016/0167-2789(90)90113-4. Erratum (pdf) Physica D 59, 430 (1992). L.S. Tuckerman, Bifurcation analysis of the Eckhaus instability, in Nonlinear Structures in Physical Systems, ed. by L. Lam and H.C. Morris (Springer, New York, 1990). L.S. Tuckerman and D. Barkley, Traveling waves in axisymmetric convection, in New Trends in Nonlinear Dynamics and Pattern Forming Phenomena, ed. by P. Coullet and P. Huerre (Plenum, New York, 1990). L.S. Tuckerman, Steady-state solving via Stokes preconditioning; recursion relations for elliptic operators (pdf) in Lecture Notes in Physics: Proc. of the Eleventh Int’l. Conf. on Numerical Methods in Fluid Dynamics, ed. by D.L. Dwoyer, M.Y. Hussaini, and R.G. Voigt (Springer, New York, 1989), p. 573-577. P.S. Marcus and L.S. Tuckerman, Simulation of flow between concentric rotating spheres. Part 1. Steady states (pdf), J. Fluid Mech. 185, 1-30 (1987). Cambridge Online Journals page. P.S. Marcus and L.S. Tuckerman, Simulation of flow between concentric rotating spheres. Part 2. Transitions (pdf), J. Fluid Mech. 185, 31-65 (1987). Cambridge Online Journals page . P. Manneville and L.S. Tuckerman, Phenomenological modeling of the first bifurcations of spherical Couette flow (pdf), J. de Physique 48, 1461-1469 (1987). L.S. Tuckerman and P.S. Marcus, Formation of Taylor vortices in spherical Couette flow (pdf), in Lecture Notes in Physics (No. 218): Proc. of the Ninth Int’l. Conf. on Numerical Methods in Fluid Dynamics, ed. by Soubbarameyer and J.P. Boujot (Springer, New York, 1985). M. Dembo, L.S. Tuckerman, and W. Goad, Motion of polymorphonuclear leukocytes; theory of receptor redistribution and the frictional force on a moving cell (pdf) , Cell Motility 1, 205 (1981). Translation into English of L’Ordre dans le Chaos : vers une Approche Déterministe à la Turbulence by P. Berge, Y. Pomeau, and C. Vidal (Hermann, Paris, 1984). U.S. edition: Order within Chaos: Towards a Deterministic Approach to Turbulence (Wiley-Interscience, New York, 1986). Editor of: Numerical Methods for Bifurcation Problems and Large-Scale Dynamical Systems, ed. by E. Doedel and L.S. Tuckerman (Springer, New York, 2000). Historical article: Les pendules de Huygens, Pour la Science, No. 310, 2003. P. Le Gal and L. S. Tuckerman, Editorial of topical issue of EPJE Irreversible Dynamics: a topical issue dedicated to Paul Manneville, Eur. Phys. J. E 37 22 (2014). P. Boronski, Spectral method for matching exterior and interior elliptic problems (pdf), J. Comput. Phys. 225, 449-463 (2007).